Another regular season is in the books. The Tampa Bay Lightning ran away with the league, amassing 62 wins and 128 points to capture the franchise’s first-ever Presidents Trophy. Those numbers are enough to place them in the conversation as one of the best regular season teams in National Hockey League (NHL) history. Meanwhile, their first round opponent, the Columbus Blue Jackets, struggled to secure a playoff berth despite an active trade deadline. 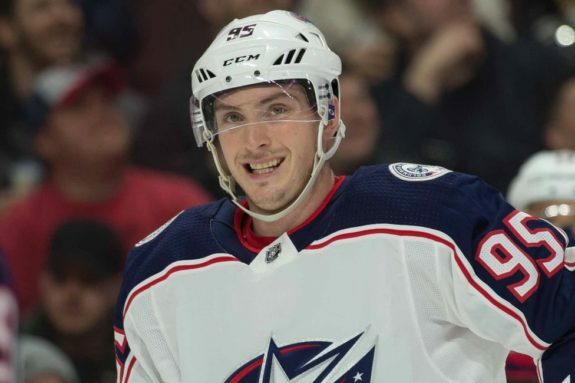 The acquisitions of Matt Duchene and Ryan Dzingel were expected to vault them into the Metropolitan Division’s upper echelon. It didn’t do that, at least not yet, but it helped them hold off the hard-charging Montreal Canadiens for the Eastern Conference’s final spot. None of that matters anymore though. The playoffs are a whole different beast. We’ve seen it before, where a team that barely eked their way into the postseason goes on a magical, March Madness-like run that ends with them making it to the Stanley Cup Final. Think 2005-06′ Edmonton Oilers, who rode a smoking hot goaltender to Game 7 of the Cup Final before falling to the Carolina Hurricanes. This series, the first postseason matchup between two recent playoff contending teams in the Lightning and Blue Jackets, comes with a whole slew of storylines. There’s the two coaches who ironically share the same first name, but that’s where the similarities end, and their Russian stars to name a few. 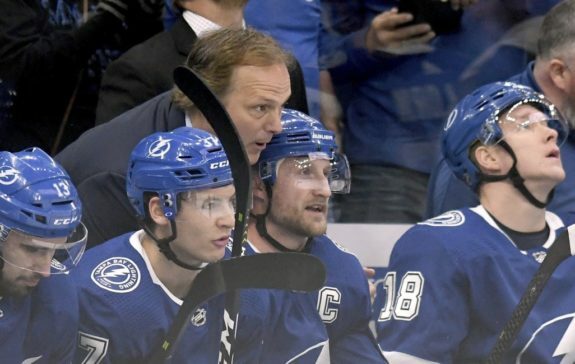 In a twist of fate, the Cooper-led Lightning, owners of the league’s best regular season record, host the man that was behind the bench when the franchise won its only Cup in 2004. 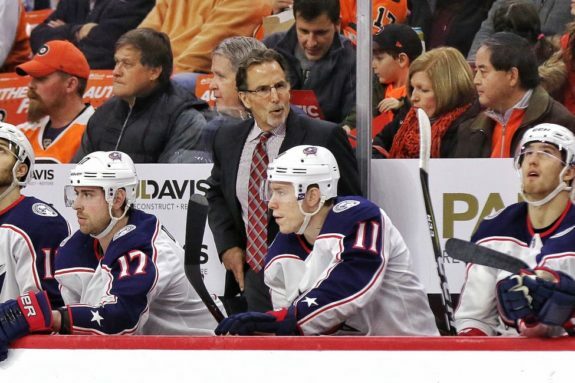 That man: John Tortorella. The man known as Torts around the league brings his fiery personality back to Tampa Bay, a place that still holds him dear to their hearts for the Stanley Cup he delivered years ago. This time, however, the stakes are higher than ever before. That means the fans that once thought him to be god won’t be shy about voicing their displeasures should his team benefit from an iffy penalty call or a gifted goal. His opponent, Cooper, is an ex-lawyer who has won a championship at every level except the NHL. In fact, many of the players on the current Lightning team played for Cooper’s 2012 Calder Cup championship team in Norfolk. That list includes Tyler Johnson and Ondrej Palat, two key pieces in the Bolts resurgence from the depths of misery to a legitimate Stanley Cup contender. Personality-wise, Cooper is a fun-loving coach that rarely loses his cool. He’s great with the media, enjoys meeting and engaging with fans and treats his players with respect. That is best seen by the way he gives the team days off during the regular season to rest their bodies and minds. For this series, it will be interesting to see who wins the coaching battle. Will it be the outspoken Tortorella, who may call out his team more than once in the postgame press conference, or the level-headed Cooper? We’ll find out over the next two weeks. Another storyline to keep a close eye on will be the duel between two of the best Russian goaltenders in the game. Bobrovsky has the edge when it comes to experience, having been in the NHL since the 2010-11′ season. He’s also appeared in five postseasons, though none lasted more than six games. Vasilevskiy, on the other hand, is entering his second postseason as the Lightning’s starter. He was great during last season’s playoff run though, posting an 11-6 record, 2.58 goals-against average and .918 save percentage in 17 games. A reigning Vezina Trophy finalist and two-time All-Star, Vasilevskiy played amazing hockey once again in the 2018-19′ regular season. He went 39-10-4 with a 2.40 goals-against average and .925 save percentage in 53 starts. Those numbers are enough to once again land him in the Vezina conversation despite missing a month early on nursing a fractured foot. For Bobrovsky, the 2018-19′ season has been rocky to say the least. After starting the season slow, the 30-year-old endured a one game suspension issued by the team and a March healthy scratch before finding his game down the stretch. He won six of his final seven starts, posting three shutouts, to get the Blue Jackets into the playoffs. Now, Bobrovsky faces his biggest test yet in winning a playoff series for the first time in his career. Against a Lightning team that’s loaded with offensive firepower, that will certainly be a challenge. Is he up for it? That will be answered over the next couple of weeks. 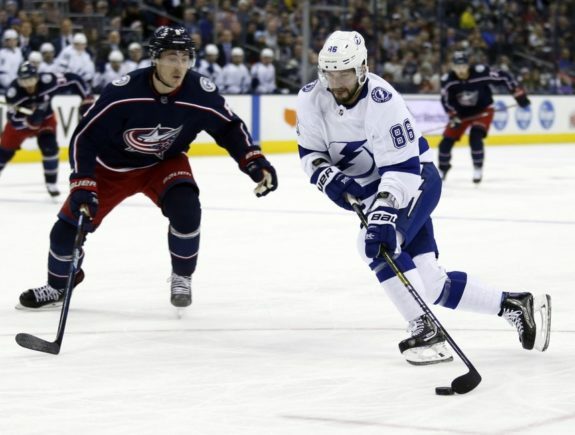 Sticking with the Russian theme, two other players to watch in this first round matchup between the Lightning and Blue Jackets are Kucherov and Panarin. Both considered supreme talents, each one has the ability to change a game single-handedly. Kucherov is arguably the best right winger in the game and one of the best Russians the NHL has seen in a long time. His 128 points during the recently-completed regular season broke Alexander Mogilny’s record for most by a Russian in league history. Those numbers landed him the Art Ross Trophy and he’s favored to win the Hart Trophy, given to the league’s most valuable player (MVP). A free agent come July 1, Panarin has keyed the Blue Jackets offensive attack. His 87 points, 59 of which were assists, in 79 games played led the team and it wasn’t particularly close. If there’s one difference between Kucherov and Panarin, it’s the fact that Panarin plays solely on the Jackets top line alongside Cam Atkinson and Pierre-Luc Dubois. Atkinson led the team in goals, with 41 in 80 games. For a team as deep as the Lightning, Kucherov mainly found himself on the second line with Brayden Point and Johnson. Given Cooper’s tendency to mix and match during games though, it’s no surprise to find him alongside captain Steven Stamkos if it makes sense and can help the team win. 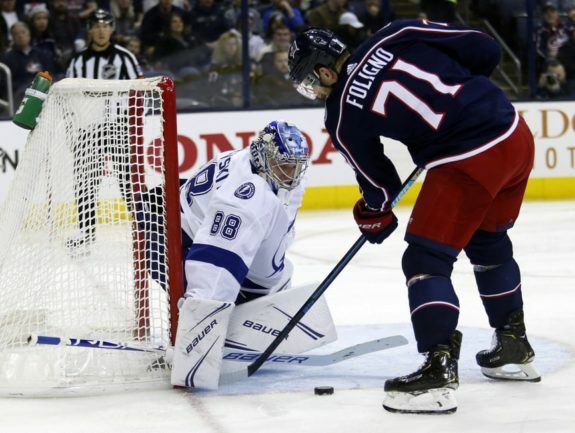 Which storyline will prevail in the first postseason matchup between the Lightning and Blue Jackets? Tune in to find out. The fun that is the Stanley Cup Playoffs kicks off Wednesday at 7 p.m.
*All statistics courtesy of the Tampa Bay Lightning and Columbus Blue Jackets.